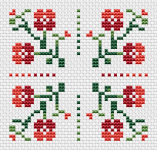 Quick and easy floral bookmark cross stitch pattern,great for beginners.You can change the colors if you like, or use only one color, a matter of choice.Happy stitching ! 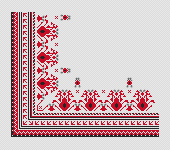 Traditional Bulgarian embroidery for tablecloths,borders and others. It was used mainly full cross stitches and a little backstitch. 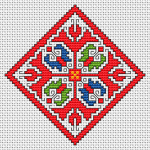 Biscornu cross stitch design with decorative elements in two colors.It can also be used for other projects, and you can even ignore the backstitch. 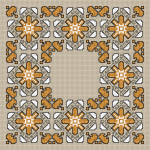 This cross stitch pattern with a repeating motif can also be used for a larger border, increasing the size by width and length to the size you need. 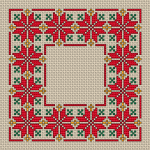 A cross stitch pattern that can be used for small panes, cards, embroidered ornaments and other designs. 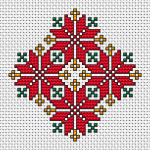 An element of the traditional Bulgarian embroidery with a rhombic shape. An abstract motif based on the traditional Bulgarian embroidery containing cross stitches,3/4 stitches and back stitches. 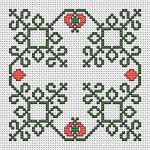 Simple motif cross stitch pattern with decorative red flowers, which can also be used for biscornu,borders, cards and more. A composition of abstract flowers with pastel colors in yellow, blue and green.This cross stitch pattern contains only full stitches. Small cross stitch panel with a motif from the traditional Bulgarian embroidery with a predominant color of old gold. Decorative cross stitch pattern of the Cyrillic alphabet - developed in the First Bulgarian Empire during the 9th century AD. Poor people have big TV's. Rich people have big libraries.Jim Rohn /1930 - 2009/. An idea for a beautiful gift to someone who enjoys reading books like in the good old days without computers,phones and big TV's.